Their first bout over two-and-half-years ago was a classic as the two pugilists exchanged punches in a five-round war that yielded a close dos Santos decision victory. Miocic waned down the stretch despite giving JDS a run for his money early. Since then, their careers have diverged sharply. Miocic is now the UFC heavyweight champion and has won four in a row, all by knockout including back-to-back first round KOs of former champions Fabricio Werdum and Alistair Overeem. Dos Santos, on the other hand, has alternated wins and losses including getting knocked out by Overeem. He has seemingly been rejuvenated in his last bout against Ben Rothwell showing new wrinkles to his game. In his bout against Rothwell, dos Santos showed an acute sense of cage awareness and prevented the behemoth from cornering him the way Cain Velasquez did. Dos Santos also showed improved footwork and the speed that made him a wrecking machine in his heyday was also evident. Miocic is a solid wrestle-boxer and ruthless pressure fighter but not on the same level as Velasquez and he is hittable especially via counters. Overeem dropped him in their last bout. This rematch will feature two reshaped and improved fighters, a difference in the action, but a similar result provided dos Santos isn't in bad shape. 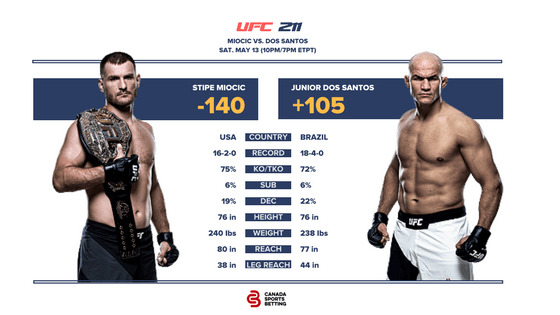 Miocic will pressure JDS and look to corner him in a cage where he'll dirty box and wrestle but dos Santos will use straight shots and improved footwork to keep the fight in the center where his speed, agility, and better boxing technique will win the night. Dos Santos will capture his second UFC heavyweight championship. Before the main event, there are plenty of other fights worth betting. Demian Maia (-115) is at pick'em odds against Jorge Masvidal. Maia is arguably the best grappler in the UFC right now. Masvidal has a versatile skillset and is coming off a big win over Donald Cerrone but Maia will aggressively out grapple him on his way to a seventh consecutive win. Former lightweight champion Frankie Edgar (-135) will take on rising prospect Yair Rodriguez. Edgar should be a bigger favourite as Rodriguez hasn't faced a wrestle-boxer with a championship pedigree like Frankie. He'll find a way to neutralize the Mexican en route to a decision victory.